An Indian-built Polar Satellite Launch Vehicle blasts off with RISAT 2, an Israeli -built radar reconnaissance satellite on April 20, 2009. India launched aclosely-guarded Israeli-built radar spy satellite Monday to begin gatheringvaluable intelligence data from a 342-mile-high perch above the planet,regardless of lighting and weather conditions. The country's 15th PolarSatellite Launch Vehicle ignited at 0115 GMT and leapt from the Second LaunchPad at the Satish Dhawan Space Center on India's east coast. Liftoff of the144-foot-tall rocket was at 6:45 a.m. local time. 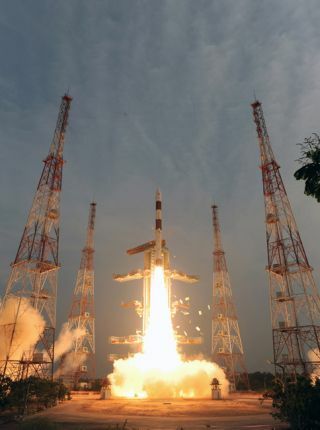 The Indian Space ResearchOrganization, which oversawthe launch, declared the flight a success on its Web site. ThePSLV was carrying a secretive satellite fitted with a dish-like radar antennadesigned to see through darkness, clouds and camouflage, Spaceflight Nowreported Saturday. The satellite, named RISAT2, weighs about 660 pounds at launch and was built by Israel AerospaceIndustries. It is designed for an orbit with an altitude of about 342 miles andinclined 41 degrees to the equator. Radars transmit beamstoward Earth and measure the reflected signals to create detailed images ofobjects on the ground. "RISAT 2 is a radarimaging satellite with all-weather capability to take images of theEarth," ISRO said in a document on its Web site. "This satellite willenhance ISRO's capability for disaster management applications." But Indian news agencieshave reported RISAT 2 will be used by the military. RISAT 2 is similar toIsrael's TECSAR satellite launched by another PSLV rocket last year. Bothsatellites look identical in available public imagery, have the same launchmass, and will operate in comparable orbits. The new satellite providesan important new capability for Indian intelligence services. Previous Indiansatellites, including a high-resolution observer launched last April, carriedoptical imaging sensors that were hampered by darkness and bad weatherconditions on the ground. For more information onRISAT 2, see our previewstory. Monday's launch also hauledinto space a small 84-pound educational satellite called ANUSAT. ANUSAT will demonstratetechnologies related to message store-and-forward operations, according to ISRO. The craft was built bystudents at Anna University, a leading engineering institution in India.